Black Diamond's lightweight trekking pole designed for four season on trail versatility, the Trail Shock Pro also features the terrain absorbing benefits of our Control Shock Technology. Control Shock is located within the grip and provides progressive four stage shock absorption with smooth rebound control on even the most rugged trails. The dual density grip and padded wrist strap provide secure, comfortable handling, and the double FlickLock Pro adjustability lets you optimize the pole for any trail or terrain. Interchangeable carbide tech tips offer secure bite on everything from granite slabs to pine duff. Your browser isn't supported for displaying eBay items. 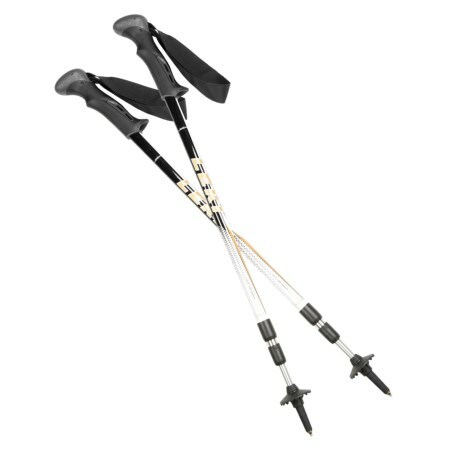 Go to eBay to search for Trail Pro Shock Trekking Poles.